Sometimes, when your schedule allows for some flexibility and you are not working with an ADR, there are some great dining options that can find you when and where you least expect them. I learned this lesson first hand during my spring trip to Walt Disney World, when during a day of touring and documenting resorts hunger grabbed a hold of me at Coronado Springs. My first inclination was to head over to the Pepper Market, but it was such a gorgeous day outside, and I had yet to sample the fare at Café Rix, so I altered my destination and made my way to Coronado Springs’ cozy cafeteria. 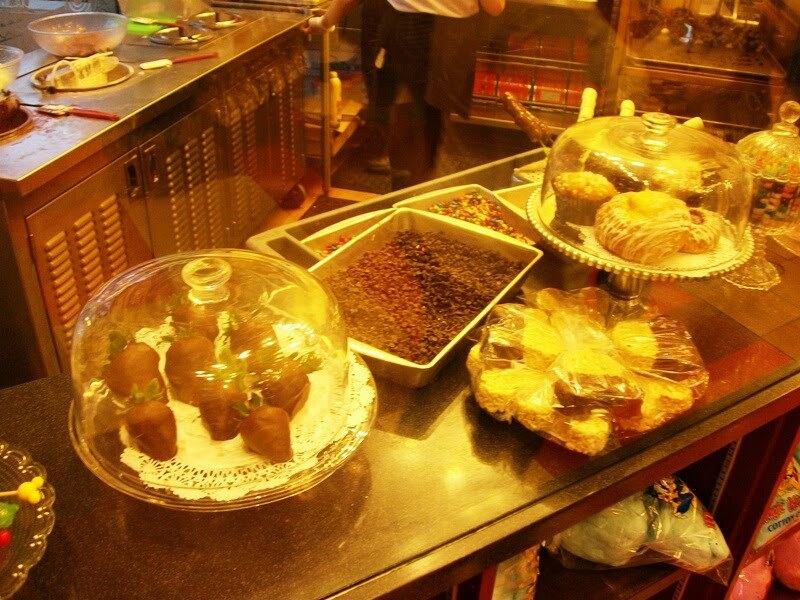 Inside, the canteen offers a variety of sandwiches, baked goods, beverages, and quick bites, but it can become a very cramped corner of the resort during busy meal times. Being a party of one, I didn’t have to worry about others getting lost in the crowd, but I could see the potential for wayward spouses or wandering children. 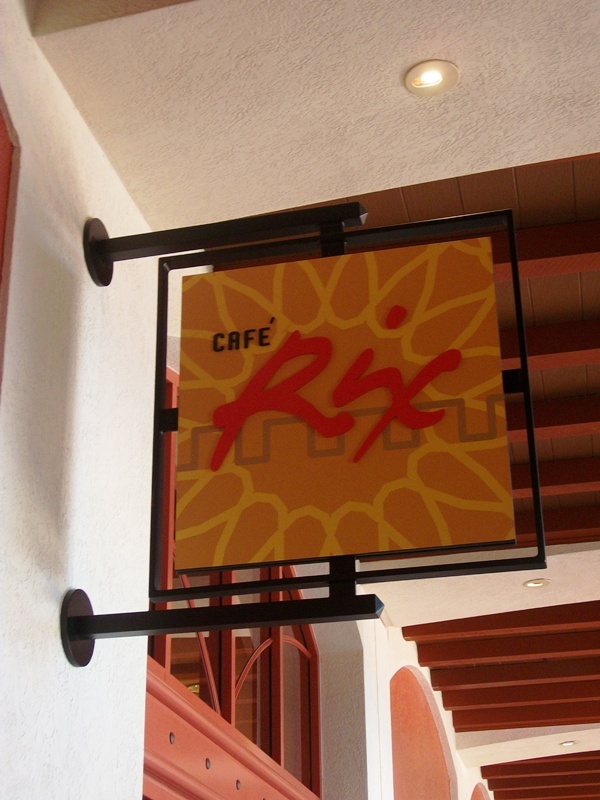 Once guests make their way through the herd of other diners, Café Rix offers a variety of seating options. There are a few tables nearby, but most guests choose the more relaxing option, dining lake-side at one of the many outdoor tables. Since the lodging buildings of Coronado Spring are positioned around the lake, Lago Dorado, dining outside offers postcard-esque views of the Dig Site, Ranchos, Cabanas, and some of the Casitas, with the added bonus of watercraft jetting across the water. The menu at Café Rix is filled with hot pressed sandwiches, including carne asada, cappacola ham, grilled chicken, and garlic shrimp, not to mention the cheese variety, cold sandwiches, and desserts that are headlined by gelato. For my part, I chose the Cuban Sandwich with chips. Living in central Florida, near Ybor City (before it was revitalized as a tourist destination), I grew up on Cuban Sandwiches, so I have a very high standard for this sandwich. Café Rix’ Cuban Sandwich did not compare to the handmade behemoths of my youth, but in comparison to the other restaurant and mass produced sandwiches I have sampled in my lifetime, the Cuban at Café Rix stands among the top tier. The bread has the chewy, yet crisp, consistency, the meats and cheese are fresh and high quality, and the pickles and mustard brings the flavors home. 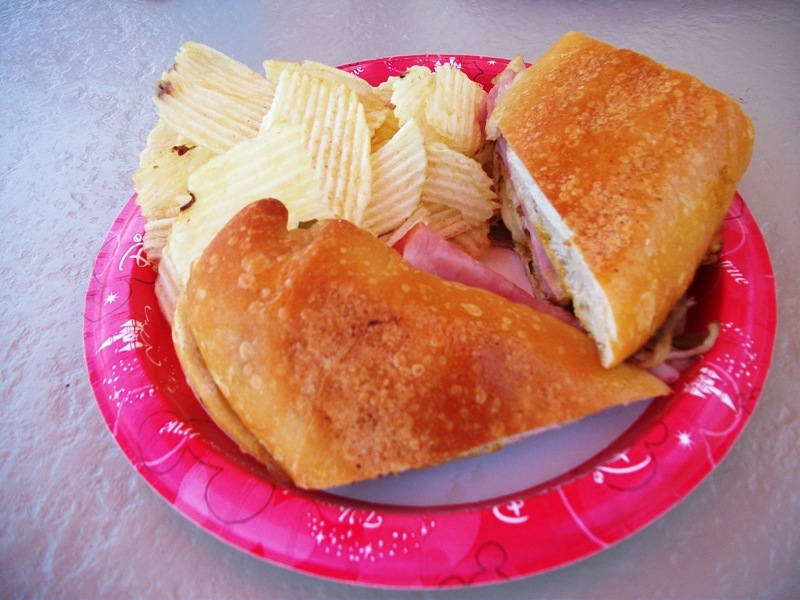 I would have never sought out this Cuban Sandwich, or Café Rix, on my own, but by keeping my options open and allowing good food to find me, I found a eatery and entrée that I would happily dine at again. 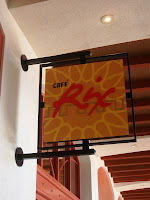 Café Rix is a hustling and bustling cafeteria that offers different dishes and some fantastic views, I will definitely keep Café Rix on my radar when I happen to be in their corner of Walt Disney World. Growing up, as is still the case, I was much more intrigued by the photographs I could obtain with my 110 than I was with the assortment of postcards available in the Walt Disney World gift shops. 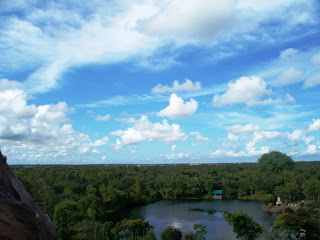 It wasn’t that I could take better photographs, I couldn’t, and it wasn’t the fact that I lived right around the corner from the Vacation Kingdom, which I did, and could see these vistas just about any time I wanted to. Postcards just never produced the ‘must have’ response in me that I felt for other items, such as telescoping cups, pennants, and plastic figures. There were, however, a single set of postcards that I collected because I though they incredibly cool. 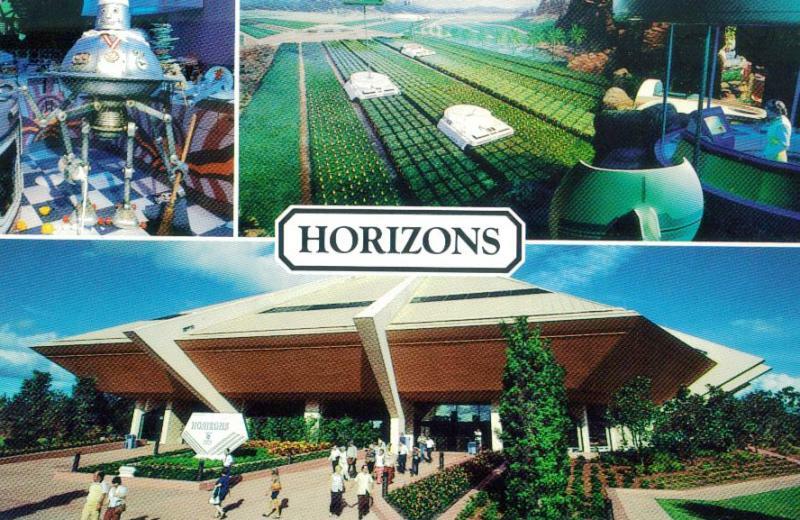 The postcards in question rarely included an exterior shot of the EPCOT Center attractions, save for the Horizons entry, but instead focused on various elements found within each pavilion. 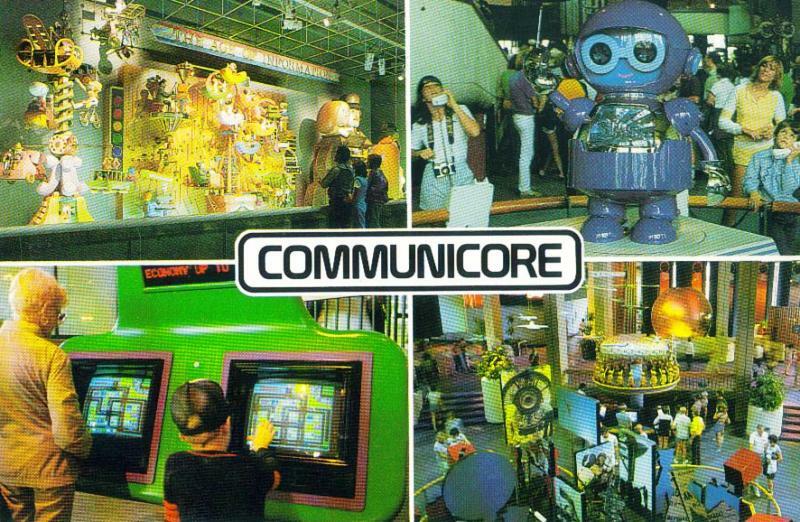 The ‘word cards,’ as I referred to them then, not only featured a series of photographs from inside attractions, but they also featured a single word or phrase in the middle of the postcard that embodied what that particular pavilion was all about. Looking back now, the postcards were as connected as they were unique. 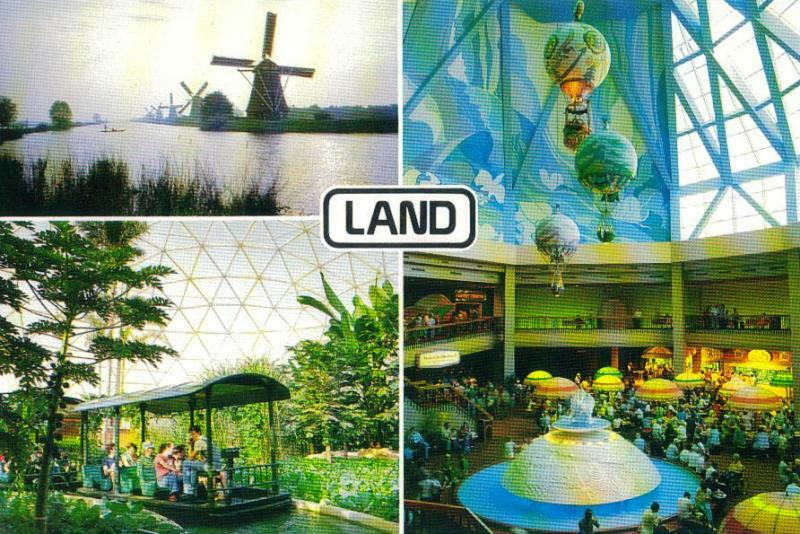 Every pavilion in Future World had a postcard, save for The Living Seas and Wonders of Life which did not arrive until 1986 and 1989, respectively. 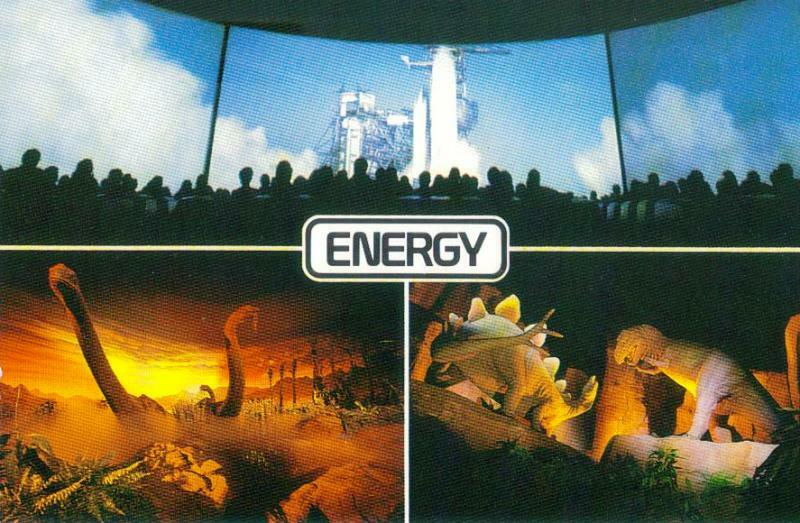 In World Showcase, on The American Adventure had a postcard in this format, which never seemed as intriguing to me as the Future World set and was the only card I did not collect. 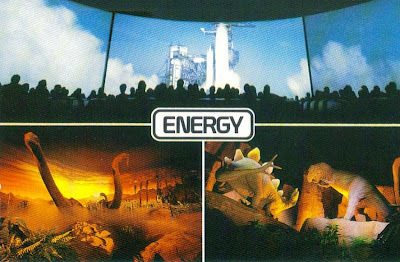 The wording on the cards varied from listing an attraction, like World of Motion, to capturing the idea, such as Energy. The lettering and word capsules themselves fell into two categories, those which used rounded edges and the EPCOT Center font and those which used angular edges and a more traditional type font. 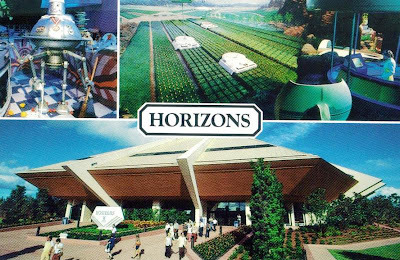 Horizons was the only postcard to use a picture of the pavilion. Half of the Future World collection used three photographs and the other half used four, of the four photograph set, only Imagination chose to not give each photograph equal face space. So, while in my youth I saw these cards as a set, each card was just as specific to its pavilion as the individual pavilions were to their theme. So, what did these postcards actually look like? What were the clever enticing blurbs on the back? You’ve waited long enough, here is what the Future World postcards I adored said and looked like. Changing communications in Spaceship Earth, a “time machine” traces the path of civilization. The spoken word becomes printed, then is transmitted, as many constantly improves his communications. Presented by AT&T. 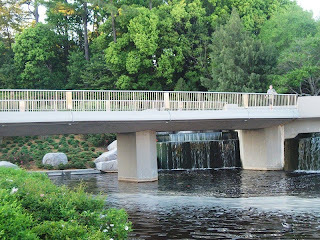 Bridge to the future The creation of fossil fuels is part of Universe of Energy in Future World. The story of the search for new energy sources even extends into the reaches of outer space. Presented by Exxon. Welcome to the future Designed to reflect all aspects of Future World, Horizons combines the many facets of tomorrow – energy, communications, transportation in a fascinating portrait of the family of the future. It’s fun the be free It’s also exciting! As man’s mobility grew, so did the complications. 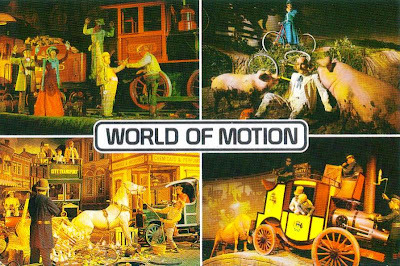 The World of Motion in Future World shows the advances in transportation throughout the ages. Presented by General Motors. Technology and innovation The latest information systems provide “hands-on” displays in CommuniCore, the hub of Future World. Advances for today and tomorrow allow better understanding of our changing world. Listen to the land in the country-fair setting of The Land, review age-old agriculture techniques. Then sail through the environments of the world and glimpse Tomorrow’s Harvest. Presented by Kraft. 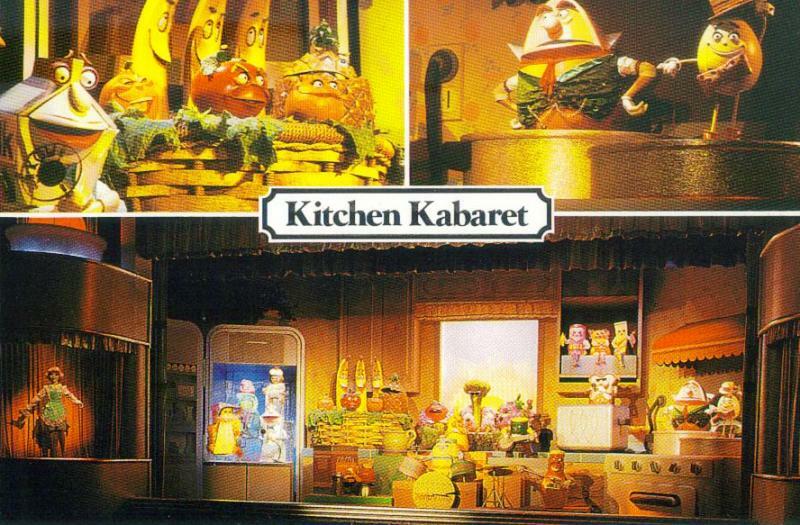 Seasoned performers Enjoy some spicy numbers on good nutrition at the Kitchen Kabaret, in The Land. Acts include Fiesta Fruit, Dairy Goods, and the hit of the Breakfast Circuit, Ham & Eggz. Presented by Kraft. One Little Spark in Journey Into Imagination, Dreamfinder and Figment introduce the Dream Machine, 3-D Magic Journeys and the Image Works, where light and sound spur creativity. Presented by Kodak. Without a pair of binoculars it is often impossible to truly inspect the vibrant colors and simple beauty of a bird in flight. Even in a perfect bird-watching environment to time to truly marvel at these winged beauties, many of which live in exotic locales all around the globe, are gone in the flick of a wing or the blink of an eye. 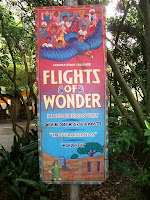 An often overlooked attraction at Disney’s Animal Kingdom, mostly because it is not a thrill ride but a production, and one that does not feature Broadway caliber songs or daring tumbling, features a vast array of feathered friends. I am, of course, speaking about Flights of Wonder. The show takes place at the Caravan Stage in Asia, along the road to Africa just past Yak & Yeti, and is an outdoor amphitheater with a brightly colored canopy covering the audience. The stage itself is an overgrown and collapsing fortress with plenty of nooks and windows for the birds to hide in, make appearance from, and disappear in to. 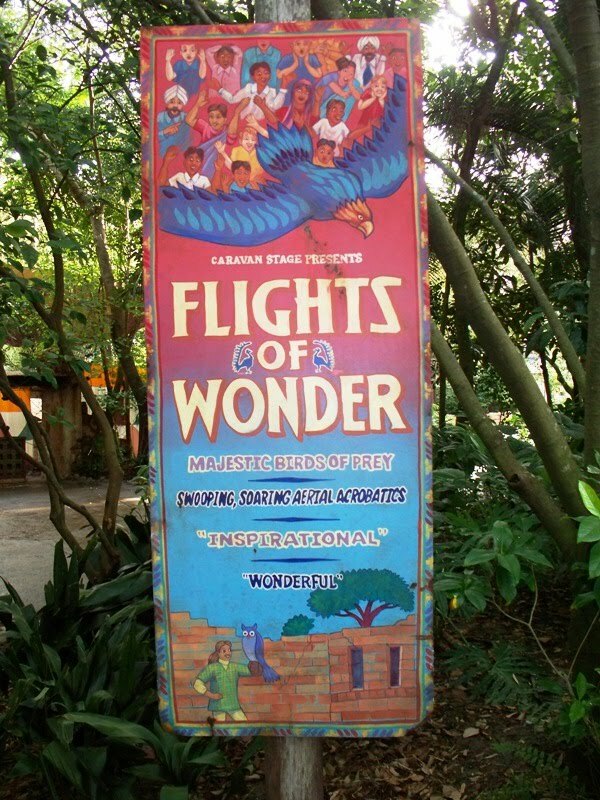 The Flights of Wonder story is narrated by a pair of hosts, one a bird handler/trainer and the other a goofy ‘tour guide,’ who crack jokes and set spectacular scenes, but the actual stars are the winged wonders themselves. 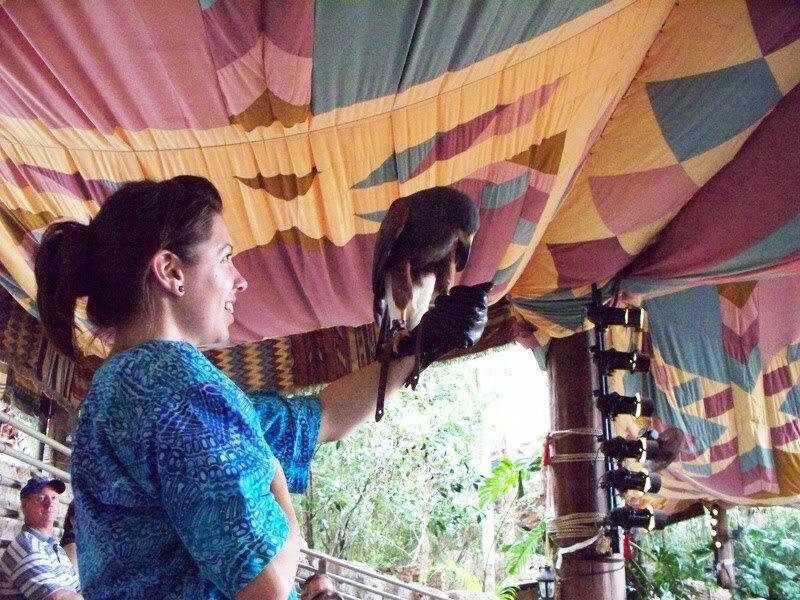 From chickens to hawks, eagles, cranes, and owls, the entire aviary community can be found wandering through Flights of Wonder. The banner outside lists quotes about that show that state it is both “Wonderful” and “Inspirational.” Those words are good, but they’re not the right words, perhaps a better pairing of words would be “Jaw Dropping” and “Enlightening.” For, as guests are told the stories of the birds, their strengths, weaknesses, and adaptations, they are drawn into the world and plights facing the avian population. 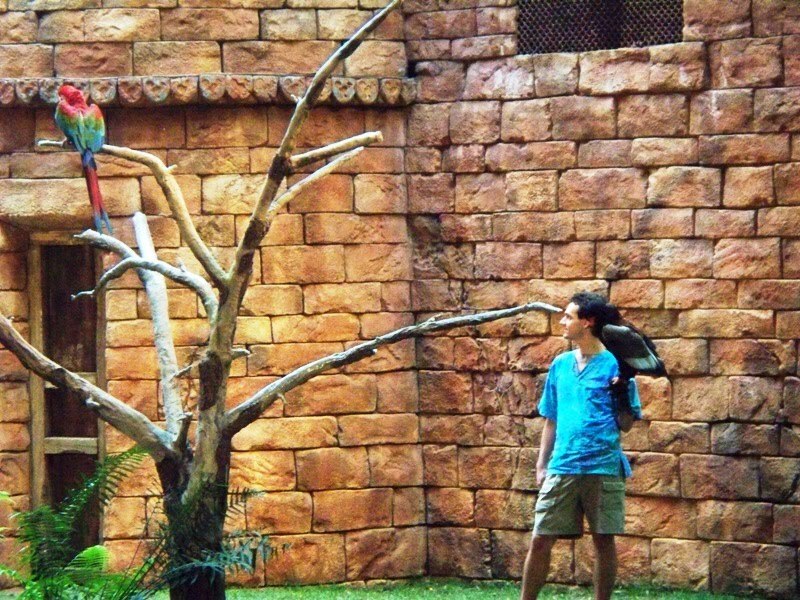 Coupled together with some fancy flying, snatching snacks out of midair, and the ability to get up close and personal with these wild winged creatures, and these are no long silhouettes against a blue sky, the birds are now flesh and blood friends that need assistance in their continued survival. While the fun and spectacle of Flights in Wonder offer more than enough reason to take in a showing of the performance (my favorite joke, for the record, is the mouse/rat gag), the program offers so much more. As guests we are given the rare opportunity to learn about these majestic creatures and watch them in action, for the winged performers Flights of Wonder offers them the chance to gain future advocates and conservationists so that their hatchlings and the guests’ children have a brighter future, together. 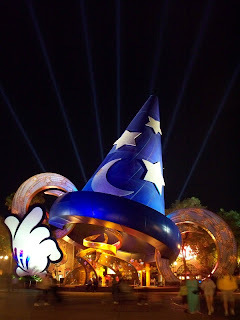 With 4th of July just around the corner, Matt Hochberg weighs the pros and cons of spending the holiday at Disney’s Hollywood Studios at Studios Central. To this generation of Disney enthusiasts, there is no brighter star than Dave Smith. Geoff Boucher, of the Los Angeles Times, has a remarkable interview and Archives tour with Dave Smith as he prepares for retirement. The intrepid photographer of Makin’ Memories, Melissa Loflin, investigates a myth about the Swan and Dolphin. The Disney Parks Blog, via Kathleen Prihoda, reveals new handheld devices for guests with disabilities visiting the parks. Channeling her inner Food Network, AJ, unveils the Best Thing I Ever Ate At Disney: Breakfast on The Disney Food Blog. As with all of his reviews, Sam Gennawey has given readers of SamLand’s Disney Adventures another book to crave for their shelves, this time in the form of Disneyland Through the Decades. 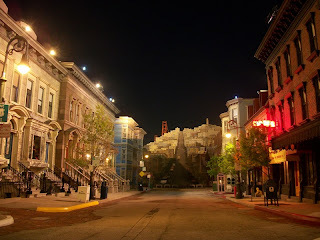 Sticking with the West Coast for a moment, for those who never had the chance to see this beloved part of Disneyland’s early years, Kevin Kidney explores the Frito Kid. Finally, this week, congratulations go out to a pair of friends of the Main Street Gazette as, over the course of the past few days both John Frost and Zanna DiMarzio have celebrated milestones. Zanna celebrated One Year of Zannaland, while John marked Six Years of the granddaddy site The Disney Blog. Way to go to both of you, and I hope this is only the beginning! Throughout DinoLand U.S.A., in Disney’s Animal Kingdom, you’ll hear a lot about a pair of its more famous residents, Chester and Hester. 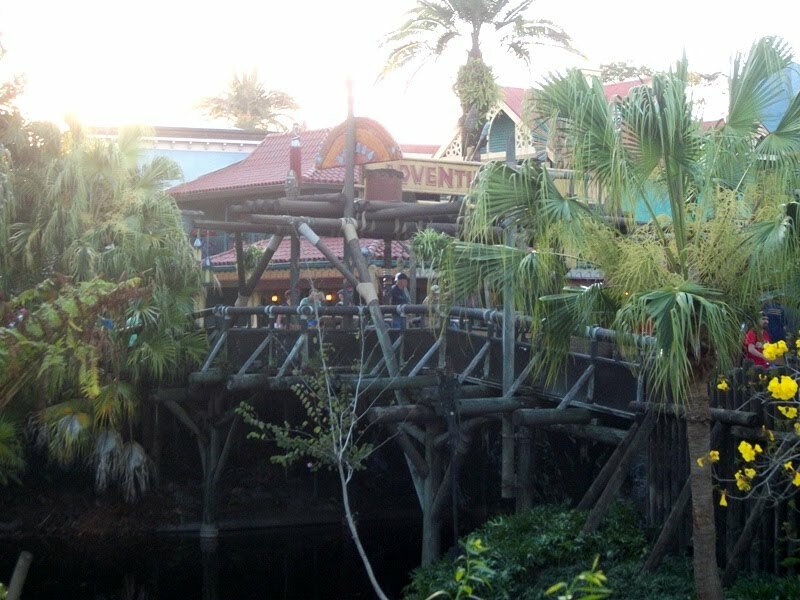 While their presence can be felt throughout the area, it is highly unlikely that guests would ever run across the pair of fossil hunters and tourist trap creators. However, there are plenty of references to the couple throughout the land, such as the poster featured here. 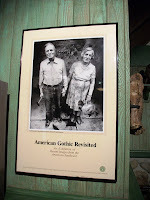 Entitled American Gothic Revisited, the photograph actually comes from a touring exhibit of the same name, the image of the stoic Chester and Hester mirrors Grant Wood’s 1930 painting and can be found hanging on the walls of Restaurantosaurus. This is not the first parody of the pastoral American Gothic farmer and his wife, the original has been parodied numerous times, including by Kermit and Miss Piggy. This photograph, however, lists the couple as paleontologists/shopkeepers and was taken in 1998. Chester and Hester were the proprietors of a gas station along route 498 in central Florida. The sleepy community known primarily for its fishing was overrun overnight once fossils were discovered. Seeing the newfound popularity as an opportunity, rather than an inconvenience, and slowly began the process of adding to their roadside attraction. 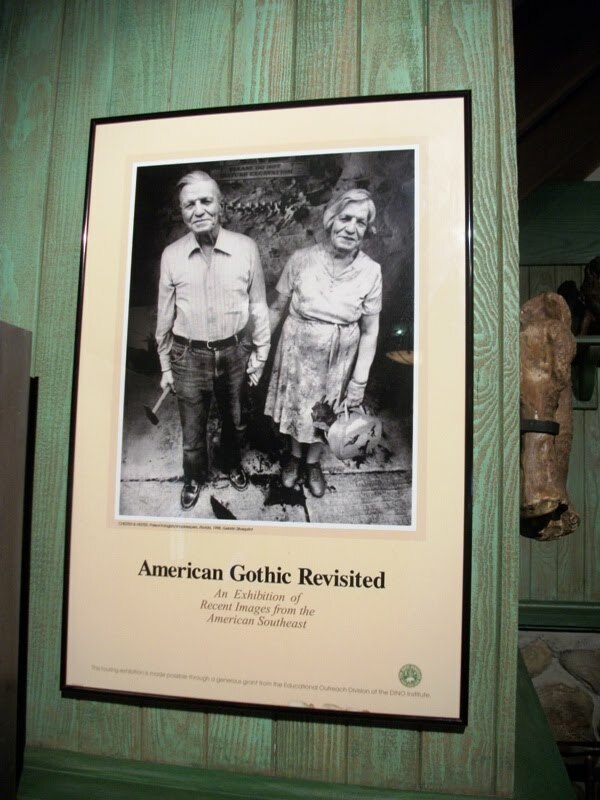 To wrap things up, we’ll head back to the American Gothic Revisited poster, where there are a few elements worthy of being examined more closely. For starters, an identical picture of the couple can be found in their one-time gas station, known lovingly known as Dinosaur Treasures. 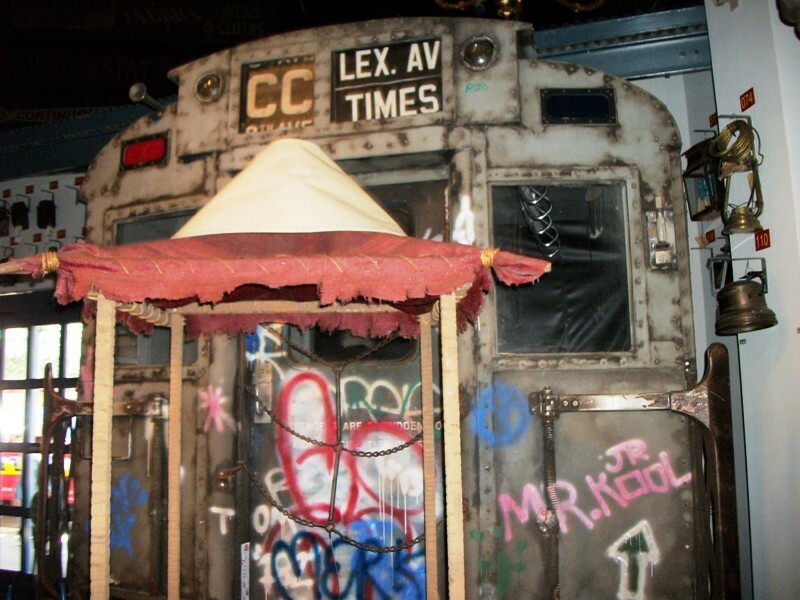 What makes the touring exhibit of Southeastern American photographs intriguing, is that it is sponsored by a grant from The Dino Institute, an organization that has long considered Chester and Hester, and their gaudy displays and rides, to be a thorn in their academic side. Occasionally, there isn’t a way to bring a photo safari to you; you have to go to it. That is precisely the prescription for today. I have heard complaints about the cost and weather compatibility of the tethered balloon experience, Characters in Flight, at Downtown Disney – West Side. 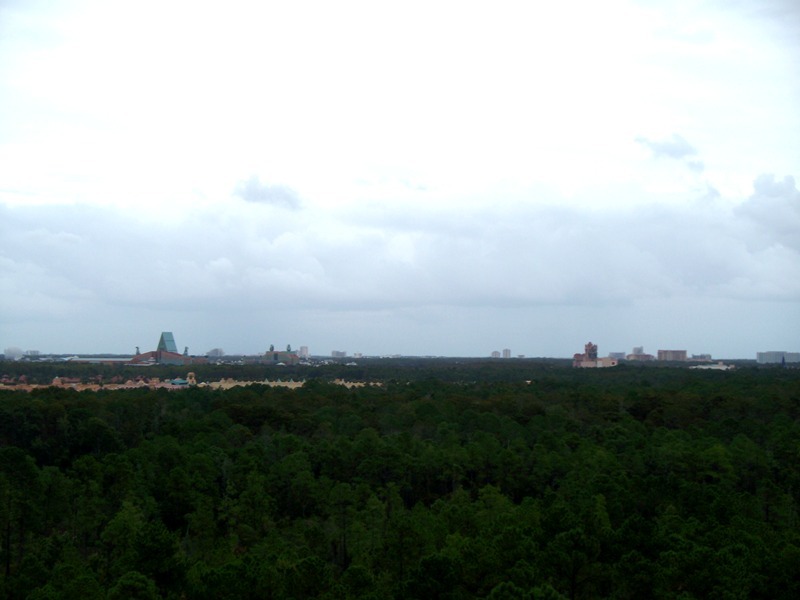 While I think that this is an amazing value for guests seeking a bird’s eye view of Walt Disney World and beyond, I decided to seek out an alternative for readers. 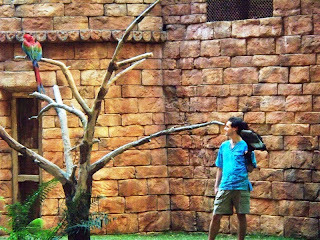 That search led me into Disney’s Animal Kingdom, and straight into Asia. There are plenty of photo safaris to be found in Asia, especially around Expedition Everest, but capturing this safari image is a challenge in and of itself. For starters, you must ask to sit in the front seat of the train. There is a special holding area for these seats, and you may have to wait for a few tea trains to leave the station, but the view is worth the wait. Once onboard, have your camera ready. As you climb past the temple and toward the mountain’s summit, there is a great view of the park, Disney’s Animal Kingdom Lodge, and Kidani Village. Meanwhile, up at the top of the mountain, where you encounter the broken tracks, there is this vista. 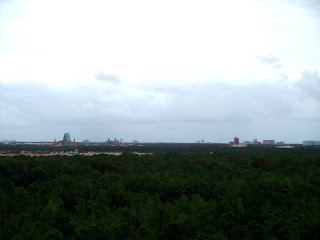 In this one image alone you can see Spaceship Earth, The Land, Soarin’, Imagination, the Yacht and Beach Club, the Swan and Dolphin, Coronado Springs, Tower of Terror, Rock ‘n’ RollerCoaster, and the Sorcerer’s Hat of Disney’s Hollywood Studios. Oh, and just after you take the photograph, cling to your camera for dear life, as you are about be whipped backwards through the mountain at top speeds. The experience of summiting Everest for this photograph is much less relaxing than Characters in Flight, but the view is reliable and comes with the price of admission. I hope readers will try both adventures and place their photographs side by side as proof of their adventures! I am not one to frequent Walt Disney World during peak times of the year, those periods that include Christmas, New Years, Spring Break, and Fourth of July. While crowds and wait times are at their pinnacle, ADRs for the marquee restaurants are impossible to book, and room rates are higher, there are a couple of perks to playing during peak times. For instance, restaurants like El Pirata Y El Perico and Tomorrowland Terrace Noodle Station are serving up their seasonal status fare. Since I was touring and dining solo during my spring research trip, I was lucky enough to round up a couple of other Walt Disney World enthusiasts to eat with me (and who allowed me to take pictures of their food…). 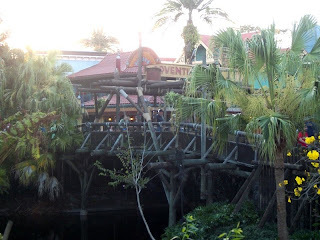 After our tour of Tom Sawyer Island, Zanna DiMarzio and I continued our day with lunch at El Pirata Y El Perico. Meanwhile, in Tomorrowland, Scott Otis and I found a couple of dinner take-out boxes with our names on them at the Tomorrowland Terrace Noodle Station. At El Pirata Y El Perico, the menu consists of typical quick Mexican dishes two types of tacos and burritos, with a taco salad thrown in for good measure. 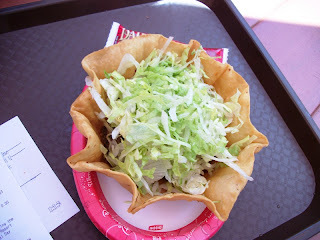 Zanna went with the taco salad, while I opted for a chicken burrito. Since all items come with the Topping Bar option, I have always found the value of the shell and meat portion of the taco salad, the most expensive item on the menu, somewhat wanting. However, Zanna seemed to enjoy her’s just fine. As for my burrito, the cilantro rice is what sets this item apart from other dishes, adding just the right amount of zest to the well seasoned beans and chicken. The Tomorrowland Terrace Noodle Station offers a different sort of quagmire. As the name implies, it does offer noodles and other Asian-influenced dishes, but only at dinner time. 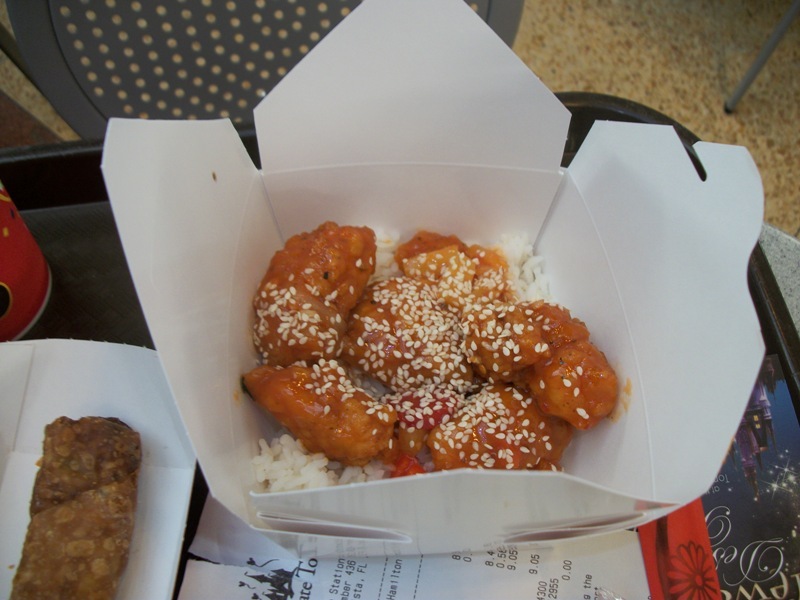 The lunch menu provides standard quick service offerings, such as burgers, wraps, and chicken items. At dinner time, the bill of fare switches over to two types of noodle bowls, chicken, beef, or tofu with steamed rice, as well as a Caesar salad with chicken, chicken breast nuggets, and vegetable egg rolls. 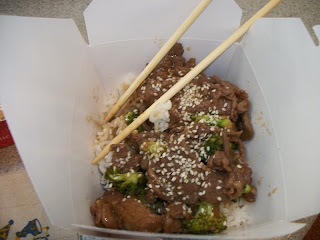 Scott sided with the Orange Chicken with steamed rice and I mixed it up with the Beef and Broccoli with steamed rice. Oh, and we both decided an egg roll was a must. While not the most inspired of dishes, they were both on par with other take-out venues I have sampled at home, and a welcome break from the regular offerings of the quick service circuit. 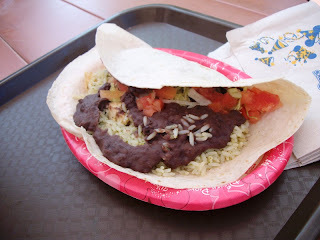 While guests may not be writing home about their meals at either El Pirata Y El Perico or Tomorrowland Terrace Noodle Station, consider the other quick service options available throughout the Magic Kingdom. If you happen to be at Walt Disney World during those crowd crazy times, I highly recommending giving you taste buds a break and sitting down in one of these veranda-wrapped dining establishments. The photograph below was originally going to be part of the Gazette's exploration into the construction of the Contemporary Resort Hotel (notice the unfinished building and cranes in the background) a few weeks back. However, at the last minute, I pulled it aside to talk about another, more visible, aspect of the picture. 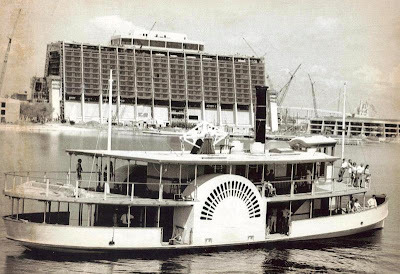 This is an unfinished Southern Seas (also known as Southern Seas I or The Seas), a steamship that moseyed around the Seven Seas Lagoon and Bay Lake during the early years of Walt Disney World along with another ship named Ports O’ Call. The steamship is an Osceola-class ship and was such an integral part of the Vacation Kingdom experience that concept art for the ship could be seen in pre-opening postcards available at the Walt Disney World Preview Center. Twilight tours of the watery worlds of Walt Disney World were offered aboard these side-wheel steamboats, but their main task was to ferry guests to and from the resorts, Magic Kingdom, and the Transportation and Ticket Center until more ships, known to us now as the ferries, could be built. 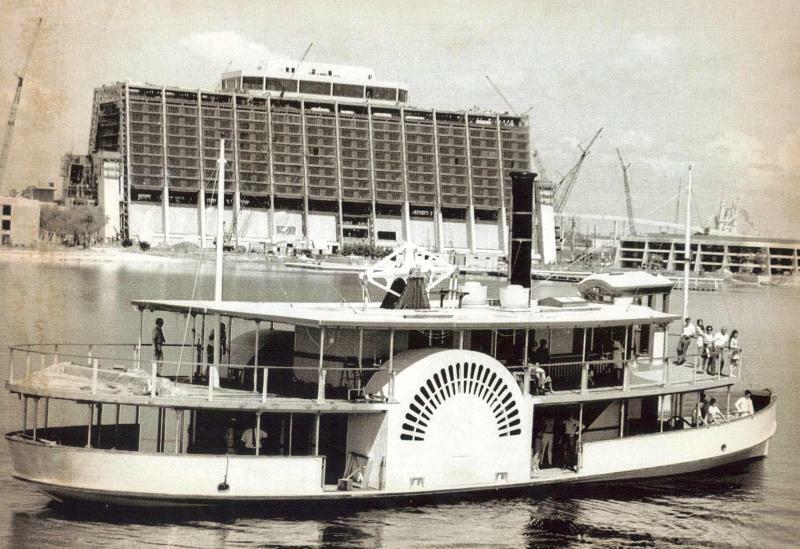 The Southern Seas was assembled at Disney Central Shops and Drydock, with portions of the hull being constructed at Tampa Bay Drydock Company, between 1969 and 1971. The brilliant thing about building these two ships is that they were modeled after ship that would have been built in the latter half of the 1800s, the perfect ships to dock near Main Street U.S.A. Unfortunately, while in drydock in 1975, the ship became half submerged. The ship was badly water damaged and finally dismantled in 1977. 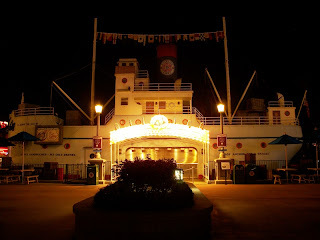 Several pieces of the ship would go on to be part of Southern Seas II, which would be retired from regular service after the opening of EPCOT Center and finally from all service in 1996. 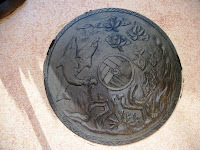 Other pieces, such as the bell, gauges, and steering wheel, of the original Southern Seas would find a new life at Typhoon Lagoon, the perfect resting place for a wrecked component of Walt Disney World’s history. By now, most of us have seen the tests, commercials, and videos highlighting the wonderful new show coming to Disney California Adventure, World of Color. The new technology incorporated into this spectacular will surely leave guests in awe. 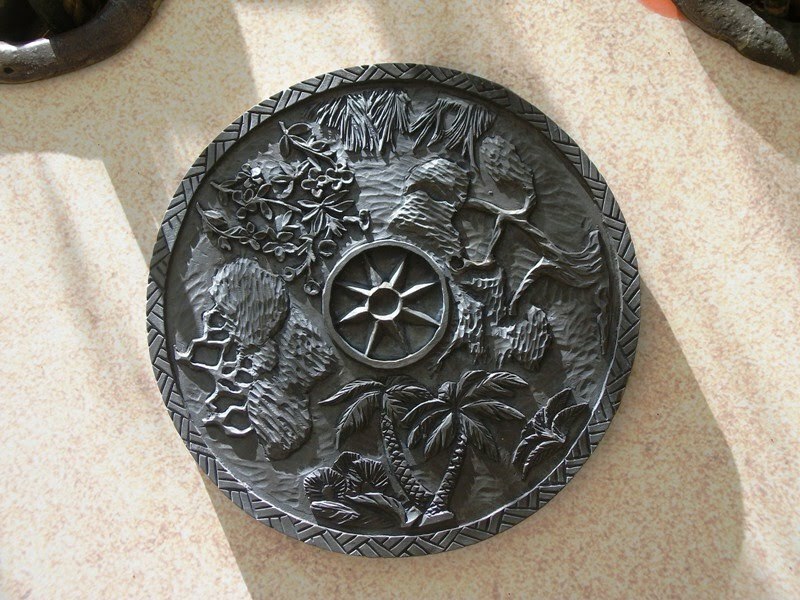 Not being a frequent traveler to the West Coast parks, due to travel budget constraints, not want or desire, viewing the visual hors d'oeuvres leaves me with only one thought, wouldn’t it be great to incorporate these elements into the World Showcase Lagoon? 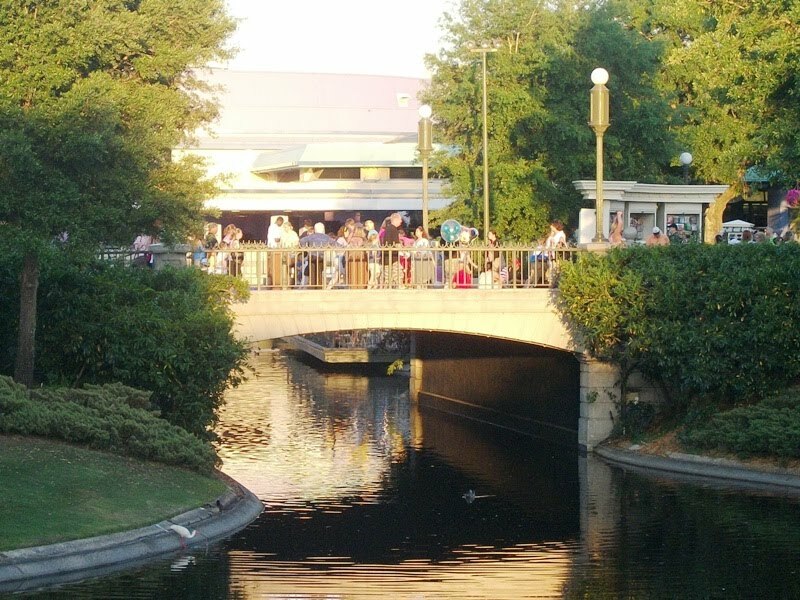 Okay, I hear the mass of IllumiNations: Reflections of Earth devotees clamoring for my head already. So let me be clear, I am one of you. I would rather spend an evening with some good food and good drink, perched along the promenade for an hour or two watching twilight descend upon World Showcase, and then cap my night off with the best nightly display on property, than be anywhere else. 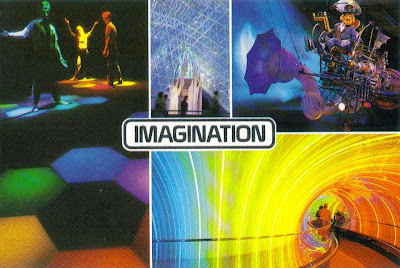 However, I was also the young adult who thought Disney could not top the laser globe, world music, and lighting effects that included a candy-coated pavilion of the original IllumiNations. I have learned in my years that it is better to be cautiously optimistic towards changes at Walt Disney World, rather than to bemoan losses and dismiss alterations out of hand, only to have to eat my words later. While I do not foresee a change, at least in this day in age, that would remove all barges from the World Showcase Lagoon, I do envision a vista with not so many barges peppering the waterscape. Aside from the benefit of not having as much of a flotilla arriving on the lagoon each night, the visuals are much more appealing. Think bursts of colored water all across the lagoon firing in unisons with the firework shells rupturing overhead. Imagine images of the world’s people, creatures, and wonders displayed closer to the guests on sheets of water. 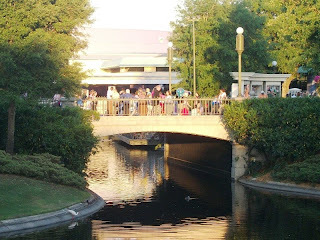 Picture a water ballet that would put the fountain in Innoventions Plaza to shame. Of course, these are just my ideas, but it does cause one to wonder. 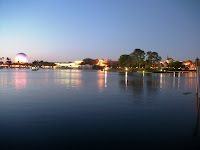 IllumiNations: Reflections of Earth is a mighty guest draw each evening. For the extended period of time that it would require to install these new elements would Epcot simply run a truncated show featuring only fireworks or eliminate the nightly spectacular portion of its day all together? I say let’s turn back the clock a little. 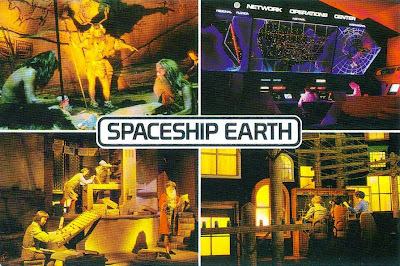 After all, with Captain EO making his interstellar return to Epcot this year, what’s old is new again. With that thought rolling around in my head, a limited engagement of an updated, say, Tapestry of Nations comes to mind. No matter what it is called, an engaging parade can pull in crowds, especially when it is only there for a narrow span of time. While no one would be as sad as I would be if IllumiNations: Reflections of Earth blew out its torches for the last time, perhaps it is time to infuse the World Showcase Lagoon with some new technology. The possibilities of what could be with the World of Color elements are endless and electrifying, as are the prospects of what could fill-in for the show. As we continue are circles around the sun of this new millennium, we should be living up to the potential set forth by IllumiNations: Reflections of Earth, not hamstrung by our adoration of it. In the end, we go on. With Pixar spending so much well-deserved time in the spotlight this week, Bakerella takes the lamp to the kitchen with Mater cupcakes. Speaking of Pixar, Shawn Slater reveals some terrific Block Party Bash details at DisneyShawn. Jennifer von Hoffman pondered over toys and children growing up at Studios Central, but these aren’t the toys you are thinking of. Disney Every Day scribe, Amanda Tinney, gives us a tour through the current condition of the Diamond Horseshoe. 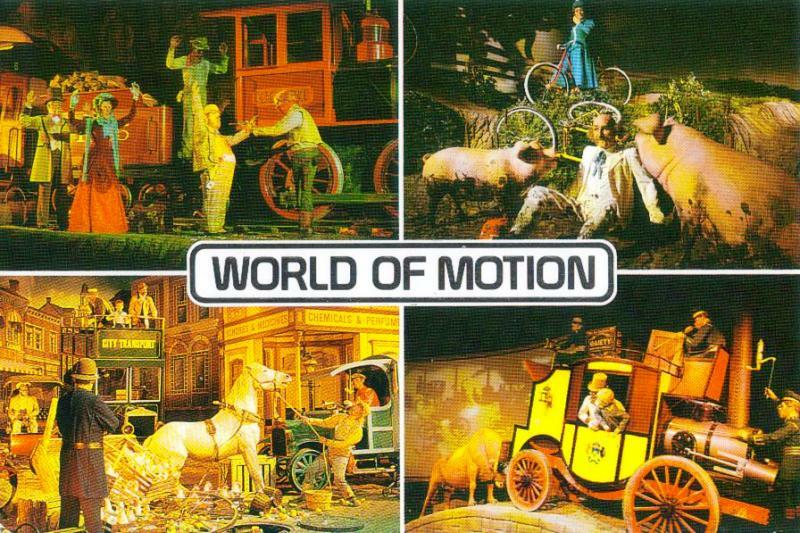 This week, Lou Mongello went wayback at WDW Radio, and took a spin around World Showcase on EPCOT Center’s Omnibus. 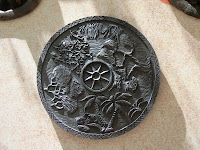 AJ highlights the variety of Sunshine Seasons over at The Disney Food Blog. Progress City U.S.A. reminds us that 1989 was the year Hollywood East was to burst onto the scene, in an article by Michael Crawford. In the category of making me extremely hungry, Andy Jackson wins with his meal photographs from Brown Derby on Eating (and Drinking) around the World. Over at Disney and More, Alain Littaye collects a gallery of Asia, DinoLand U.S.A., Beastly Kingdom concept art and behind-the-scenes work. Spring is in the air over at DF’82, where Princess Fee has a series devoted to Tokyo DisneySea’s Spring Carnival. 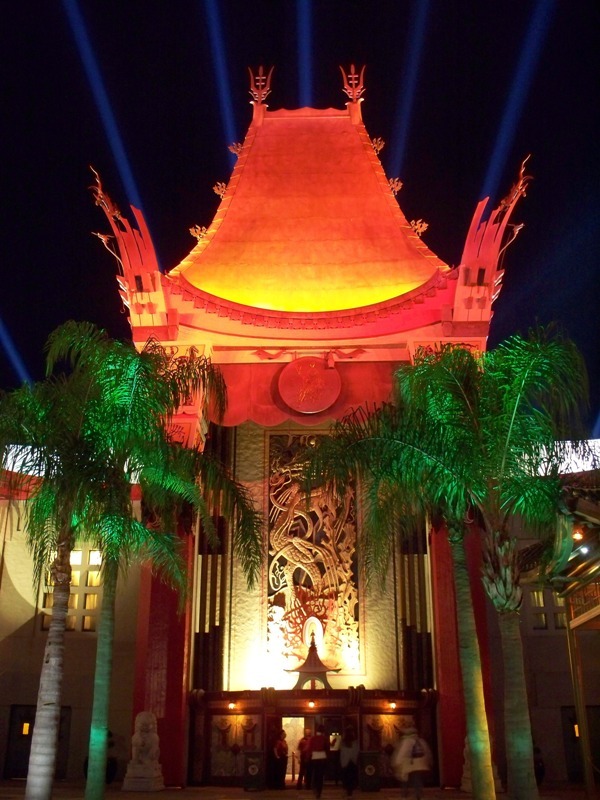 Finally, this past week was The International Hollywood Studios Awareness Week, as set forth by Matt Hochberg and Studios Central. Take a peak at the various articles, ideas, and comments that sprang up in celebration of Disney's Hollywood Studios. 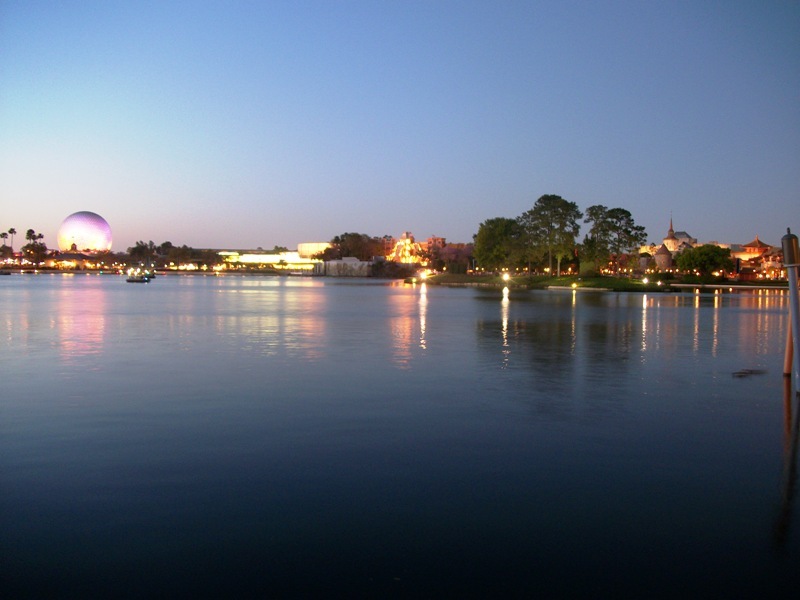 There is something special about the parks of Walt Disney World after the sun has set and the lights have come on. The glow on the rockwork, the subtle way the shadows play against the cracks and carvings, and the neon of yesterday or tomorrow beckoning us away from today all add a spark to the atmosphere that cannot be found during the daylight hours. Photographers clamor for that perfect photograph of the pavilions in World Showcase at night. 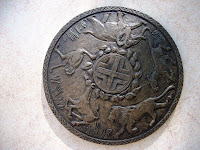 Pictures of the silhouette of Everest and the animal carvings found on the Tree of Life after the wildlife has gone to sleep are feathers in the cap. 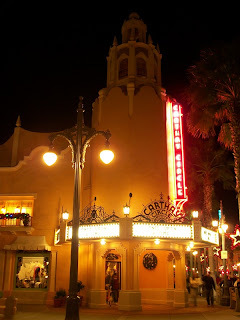 However, for my eye, Disney’s Hollywood Studios offers some of the best nighttime photographing, or strolling atmosphere, of any park in Walt Disney World. From lighting a village from long ago in a galaxy far, far away, to the hum of the neon illuminating Hollywood’s golden boulevards, there is nothing like it. Let’s take a walk, shall we? There is something about watching a treat take shape before your eyes that makes it taste better. 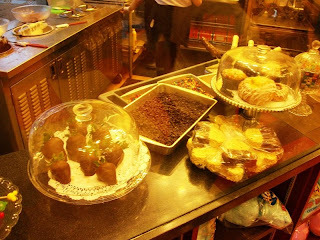 For many years the only place for such an eye and mouth watering event to take place was inside the Magic Kingdom at the Main Street Confectionery. Today, however, sweet spells are also cast over at Disney’s Hollywood Studios at the aptly named Sweet Spells. 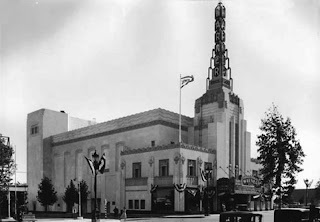 The building itself is a theater, the Beverly Sunset, and is modeled after the Warner Beverly Hills Theater. 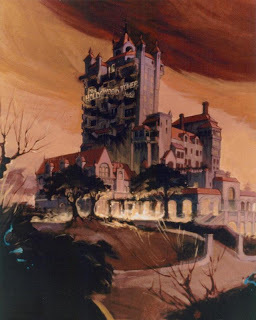 The interior, which also runs through Villains in Vogue and The Scary Apothecary, has a much more menacing feel, as several Disney villains leer at guests from above, almost daring them to purchase and sink their teeth into the sickeningly sweet concoctions. Of course, the only real danger to be found here is a stomach ache or a cavity. Looking out over the crossroads of Hollywood and Sunset is the confectioner’s station. Here, apples are coated and covered with a variety of ingredients, while marshmallows and strawberries are dipped and dried. 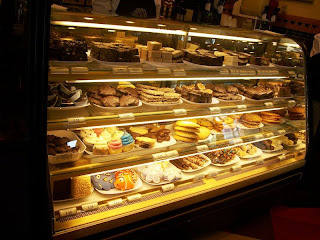 In the various display cases every sweet dream imaginable can be found, from the apples, strawberries, and cookies, to rice treats, fudge, toffee, and various chocolate covered patties. The question really isn’t what should you buy, but what you shouldn’t! Everything I have sampled here has been rich, smooth, and sweeter than expected. Perhaps it is only that personal penchant shining though, but the hand crafted items always seem to taste a teensy bit better to my taste buds. 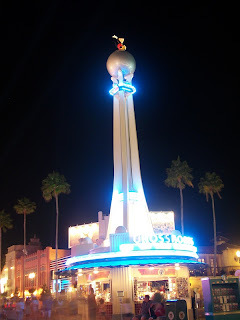 Even if you are not in the mood for something sugary to eat, and the only reason that should be is if you’ve just been partaking in the Brown Derby’s grapefruit cake, it is well worth your time to stop in to Sweet Spells for the show kitchen. Watching these artisans at work, and believe me, working with sugar is as tricky as it gets, is pure poetry. Dipping, cooling, forming, fastening, affixing, decorating, and displaying is a lot of hard work involving a lot of heated elements, and the finished products are truly works of art. Taking a few moments to watch the process and thank the hard working Cast Members will make you feel just as sweet as the confections they are concocting. Main Street U.S.A. no longer has the market cornered on sugar preparation. The Beverly Sunset, otherwise known as Sweet Spells, is a pinch of Hollywood history, a vial of villains, sacks full of sugar, and a heaping helping of artistry. Whatever ingredient brings you in, Sweet Spells has just the treat you are looking for. 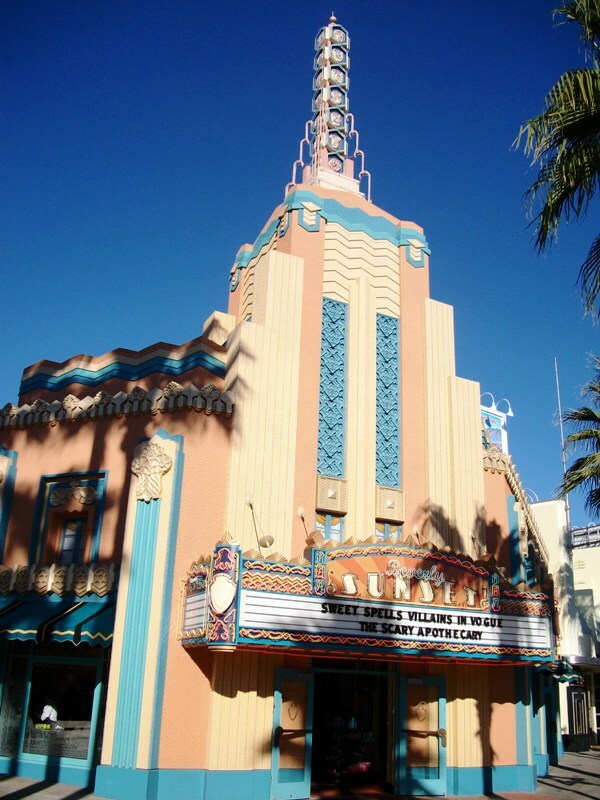 In the early years of Disney-MGM Studios, it was clear that the park had a definite story to tell about Hollywood, however, there was not a niche audience for the park. The Magic Kingdom was tailor-made for families and EPCOT Center allowed adults to travel the world and see new ideas all within one cozy destination. 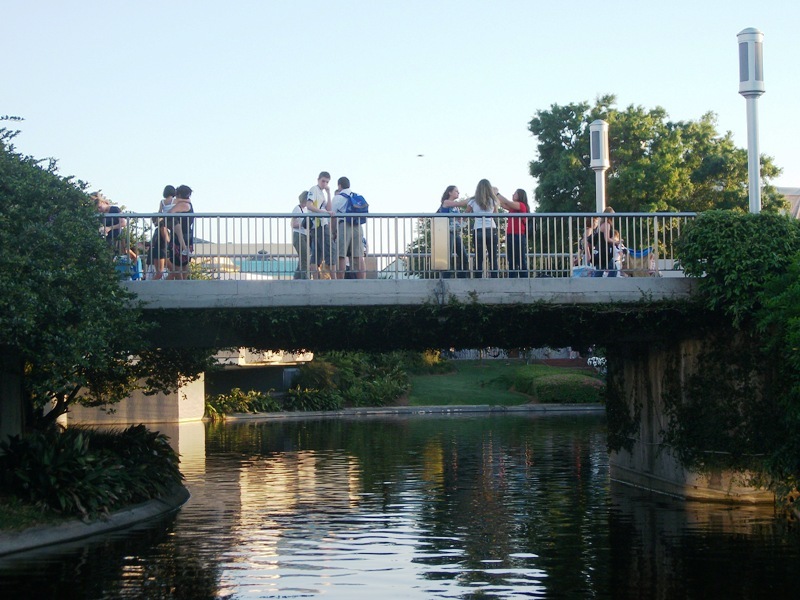 The ideal target for the park would, obviously, be teenagers and college-aged adults. 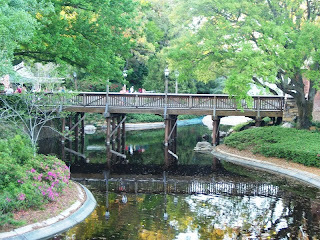 The parks of Walt Disney World had it thrills, but nothing too extreme. To crank Disney-MGM Studios’ dial up to 11, or should I say 13, it would take something with a bit more speed. Enter The Twilight Zone Tower of Terror. Originally, the story did not tie to The Twilight Zone. There had been plans in the works for a walk through haunted hotel, ramping that idea up would be the inclusion of a storyline involving a silent film director who had been driven from his career and life by the invention of films with sound. The director still haunted the hotel, and its guests, and would ultimately cut the cables of the hotel’s elevator, plummeting the guests thirteen stories down. The elevator portion of the attraction would utilize ride technology that already existed, thus minimizing expense and bringing a new level of excitement to the park. Unfortunately, trying to entice teenagers with a concept they knew little or nothing about, silent films, would work against this concept. 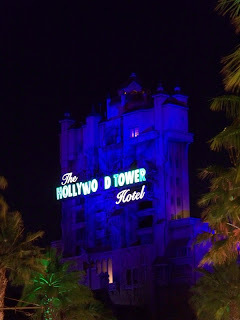 Instead, Imagineers harnessed the fifth dimension property, The Twilight Zone, which had become popular again in syndication. 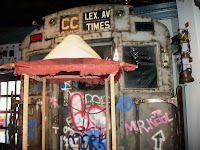 They also reinvented the ride system, allowing for a free moving elevator ride vehicle. The Twilight Zone Tower of Terror would live up to its lofty expectations by creating not only the tallest attraction at Walt Disney World (until Expedition Everest trumped it by six inches), but one of the most meticulously detailed. Rod Serling would appear in both voice and in film, though sometimes through the use of a voice impersonator. The lavish Hollywood Tower Hotel, the setting for The Twilight Zone Tower of Terror, would include period furnishings, some found and some recreated by the original companies, 19th century bronze sculptures by Moreau, and a litany of The Twilight Zone references scattered throughout the lobby, library, boiler room, and basement. The story even included a way to preview the attraction to potential,… err… victims. 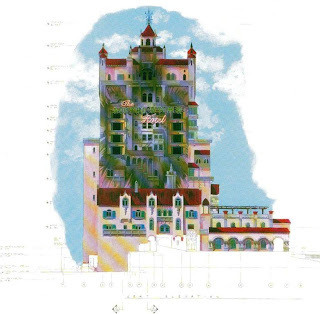 By having the elevator towers vanish during the original lightning strike in 1939, large holes were left in the side of the Hollywood Tower Hotel’s superstructure. These portals would allow guests on Sunset Boulevard to see the adventure awaiting them. The nightmare created by the imaginations of The Twilight Zone and Imagineers has been opening doors to the fifth dimension since 1994, with nary a silent film director in sight, but plenty of thrill-seeking teenagers. It is always a pleasure to sit down and speak with Lou Mongello on any topic we can come up with. This week on the WDW Radio Show, we skip the Wayback Machine and travel aboard our very own Time Machine to Tomorrowland and its Metropolis Science Center to visit with The Timekeeper. Join us on our journey during Episode # 174 of the WDW Radio Show! 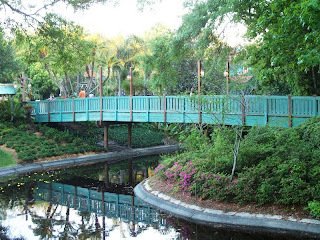 Being a guest at Walt Disney World should not be a passive experience. The stories being told in the attractions, shows, even in the buildings that line the lanes are only as immersive as they guests choose to let them. 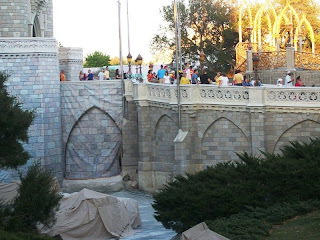 Involvement is crucial to the success of the narratives, from the World Showcase Players to the interaction between a Cast Member and a ‘princess,’ occasions to take part in these stories are everywhere. The pinnacle park for interactive opportunities is Disney’s Hollywood Studios, an actor and actress’ paradise where dining, shows, and street performances all offer chances to become part of the tale. Here are a few of my favorite ways to get in on the act. Sitting down to a meal at 50s Prime Time Café is not a passive meal experience. The restaurant seeks to create dining rooms that could pass as a 50’s prime time kitchen set. Once seated at the kitchen table, a guest can try to keep their head down and just finish a meal, but the waiters and waitresses, otherwise known as uncles and aunts, are going to chide, berate, humiliate, mock, and even feed guests their vegetables if need be. One way to make this experience more enjoyable, apart from savoring each bite of the meatloaf and fried chicken, is to engage the uncles and aunts. Involve them in shenanigans, quip back at their sarcastic remarks, and, if you are a glutton for punishment, keep your hat on while eating or elbows on the table. Whatever the tack to play into the act, make sure you do not tattle-tale on the other diners sitting around the table. An immense theater filled with hundreds of guests is not the place that most people want to make their acting or singing debut, but situated around Echo Lake are a couple of shows that offer just that opportunity to the brave. The newest addition to the park, The American Idol Experience, gives guests the opportunity to see if they have the chops to take the Hollywood heat and the chords to hit the high notes. 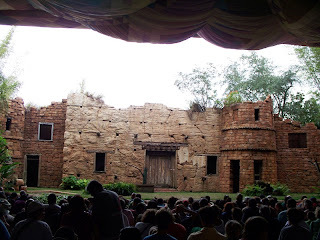 Just around the corner, the Indiana Jones Stunt Spectacular puts guests in the middle of an action flick with smaller extra roles. Both of these performances offer a variety of experiences from making a mockery of yourself by laughing, screaming, and posing at Indiana Jones Stunt Spectacular or through auditioning, belting out a tune, and hearing the applause of the audience at The American Idol Experience. Perhaps the least regimented of all of the interactive activities at Disney’s Hollywood Studios are the interactions with the park’s troupe of streetmosphere performers, the Citizens of Hollywood. Found working along Hollywood Blvd. and Sunset Blvd., these actors, actresses, film crews, and community helpers, the Citizens of Hollywood are looking for guests to assist them in their daily functions. Whether it is assisting a director, fanning an actress, performing a water check, performing for a production, or being issued a ticket, guests have the opportunity to be a part of the impromptu shows that take place throughout the day. Becoming involved in one of these performances or interactions, surprisingly, doesn’t take much, just a willingness to be the guest who puts yourself in the middle of the action. The stories are meant to give guests not only an immersive story to be a part of, but a memory that will last years after the trip to Walt Disney World has ended. It is easy to pass by these experience, or to simply sit in the audience, but let that be some other guest. The next time you’re at Disney’s Hollywood Studios, stand up and stand out, laugh at yourself, and become a part of Hollywood. Princess Fee gives our vocabulary a new phrase to use over at DF’82, Main Street Delicatessen. The words seem to just fit together like the perfect sandwich. 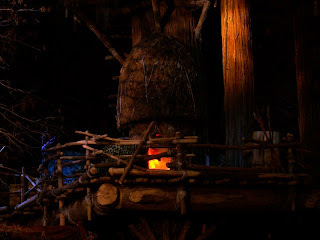 One of my favorite resort shops, at least for décor, is covered at DisneyShawn this week, when Shawn Slater takes readers on a tour of Bou-Tiki. The Disney Food Blog made me do a little dance when I read the article AJ wrote about the new pizzas and storyline coming to Via Napoli. A lot of the coverage at the Disney Parks Blog over the past few days has focused on the premiere of World of Color. However, photographer Gene Duncan gave us a great shot of Main Street U.S.A.’s Mayor George Weaver and Chief Smokey Miller. Over at Meet the World, TokyoMagic! uncovers a Sleeping Beauty that hasn’t been seen in many years. Michael Crawford visits with my favorite Imagineer and one of his earliest projects at Progress City, U.S.A., George McGinnis and the Underground Train of Tomorrow. Zannaland features Raglan Road’s chef, Kevin Dundon, being skewered by Zanna DiMarzio, but in a nice way! This week, the Main Street Gazette took a look at the construction of the Contemporary Resort Hotel. Afterwards we were reminded by George Taylor of some terrific Contemporary construction photographs from The Story of Walt Disney World featured a while back on Imaginerding. There are a variety of stories of creation and legends of how elements of our world came into being in every corner of our planet. 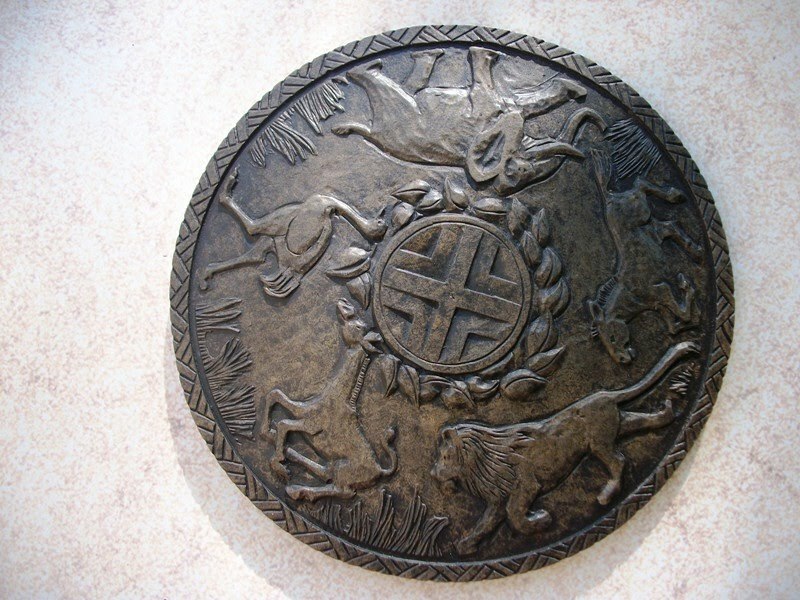 Drawing upon these tales, Disney crafted its own stories for the savanna of Disney’s Animal Kingdom Lodge. These narratives are posted for all to enjoy and carry with them a story circle. When the world was young, the Mother of Life came upon this place and saw nothing but dry earth and bare rock. Knowing that her animal children would soon arrive, she cast a lush carpet of tall grass upon the ground to soften their footsteps. She scattered thick brush about as places to rest and hide. She planted tall acacia trees with broad canopies of leaves, to offer cool shade from the hot sun and shelter from the pouring rains. Finally, she made the flowers, which waved in the breeze and welcomed the animals to their new home. Many summers ago, a herd of wildebeest traveled from waterhole to waterhole, only to find them all dry. One day, while resting from their endless searching, the herd was startled by a loud rumble. Looking up, they saw dark clouds on the horizon. Unsure of the sound, the animals prepared to flee. But one young wildebeest paused, sniffed the air, and caught the faint scent of rain. Boldly, he moved towards the clouds. The others cautiously followed, and soon they found pools of fresh rainwater. To this day, wildebeest migrate toward the sound thunder, and the promise of life-giving rain. And that is how the dung beetle came to be. Standing at the Partners statue, the crossroads of the Magic Kingdom, guests are at the heart of Walt Disney’s ingenious design element, the Hub. 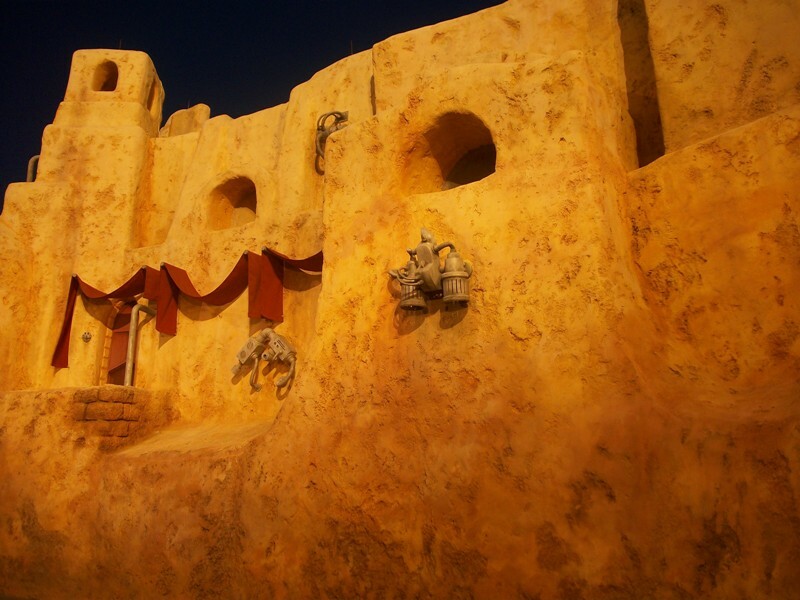 The Hub and Spoke allowed for guest to move between lands, back and forth, from a central point. What most guests don’t realize is that the Hub is completely surrounded by water, so, in order to move from one land to another they must cross a bridge. These bridges are as unique as the lands they represent, so let’s go ahead and start the tour. 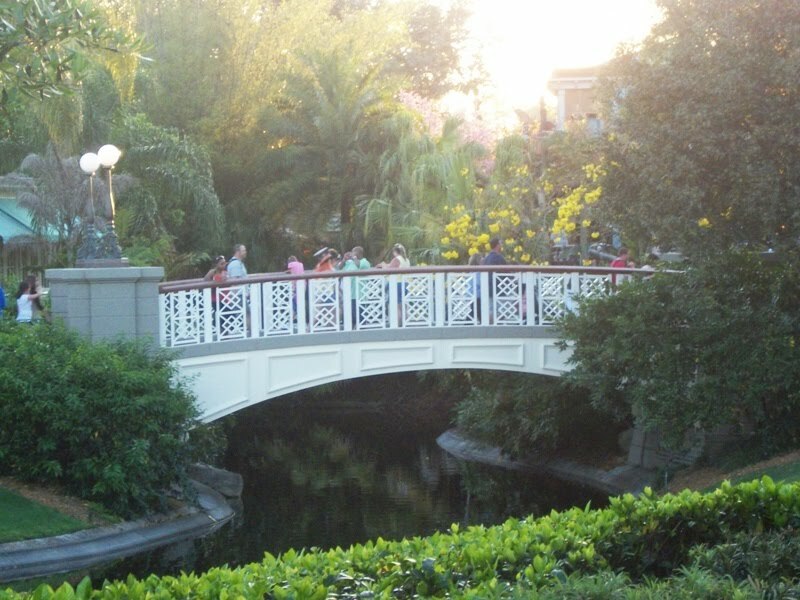 UPDATE: Per a reader request, the photographs are in a clock-wise ordering of the bridges starting at Main Street U.S.A. 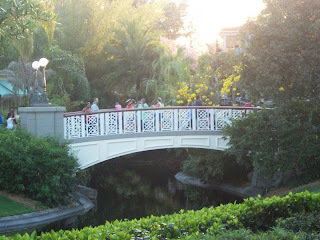 In order, the bridges are from Main Street U.S.A. to the Hub, Crystal Palace to Hub/Adventureland, Hub to Adventureland, Hub/Aventureland to Liberty Square, Hub to Liberty Square, Hub to Fantasyland (a la Cinderella Castle), Hub to Fanatasyland/Tomorrowland, and Hub to Tomorrowland.